KnoWhys are daily features produced by Book of Mormon Central in the form of short essays, videos, memes, and podcasts. Each KnoWhy is designed to provide unique insight into the details of the Book of Mormon, through the explanation of both researched information and personal application. It is our hope that through KnoWhys, the reader will come to better understand both the "know" and the "why" of the Book of Mormon, strengthening his or her testimony of Jesus Christ and his gospel. 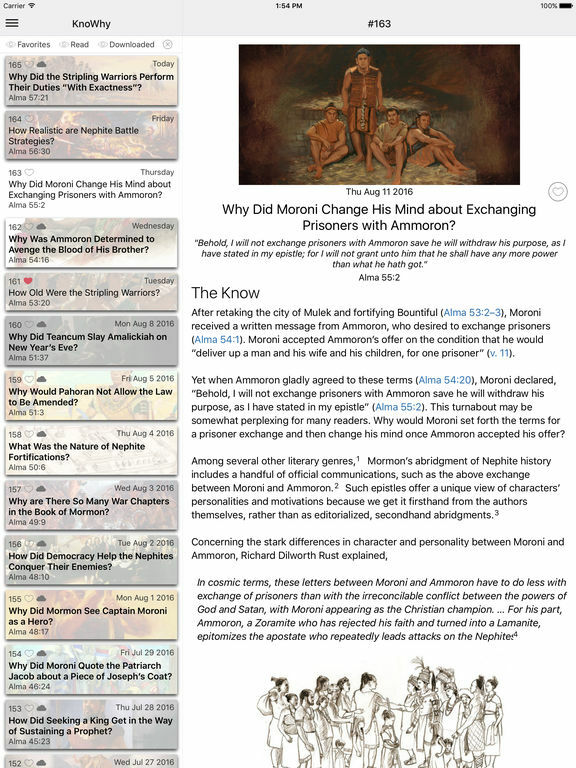 The KnoWhy app offers instant access to the hundreds of KnoWhys produced by Book of Mormon Central. Read the text, view the images, and read through the references right from your iPhone or iPad. Book of Mormon Central is an organization committed to increasing understanding of and faithful engagement with the Book of Mormon. Our team of archivists, researchers, writers, editors, reviewers, illustrators, narrators, audio engineers, video engineers, web designers, web and mobile developers, graphic artists, and social media publishers are working together to share the wonders of this inspired masterpiece with the world.